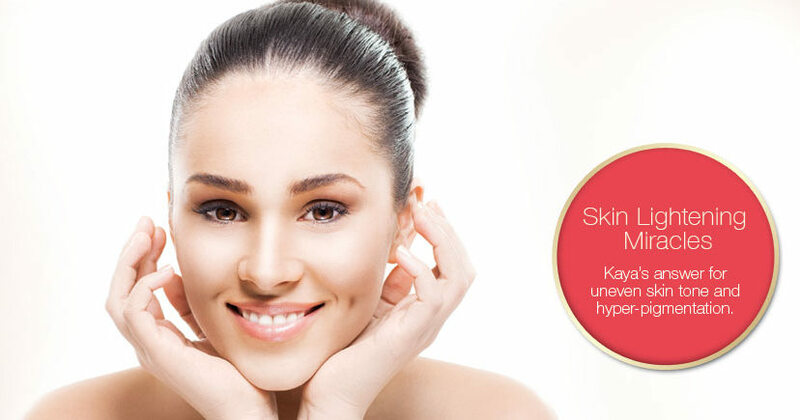 Hi Acne Mantra fans & member, it’s LD again & I am back with a review on one of Kaya’s Laser services – The Skin Lightening Miracles. Firstly I would like to thank AM aka Sonal for giving me the opportunity to take a complimentary trial session with them for this. Kaya folks were quite professional. They; called me and fixed the appointment at Indira Nagar Branch, Bangalore. (This service is not available at Whitefield, koramangala branches). I had insisted that I would like to speak to a Kaya doctor before proceeding for the service as I had some doubts to clear. 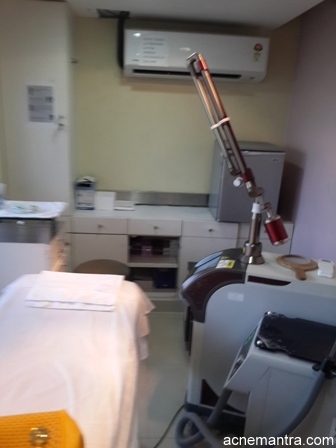 I met the dermatologist at Kaya before the treatment, he assessed my skin under some light, explained the whole procedure how it’s done (do visit their website to know details; I don’t want to bore you guys with the technical stuff). 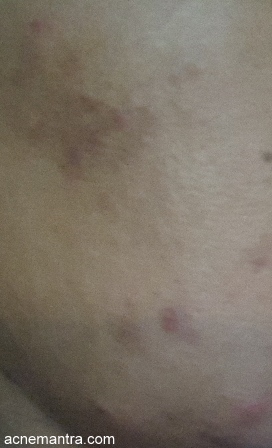 He mentioned for my level of spots/scars, it would take about 4 to 6 sessions to lighten them completely. He also examined my skin, stated it was normal with some open pores on my nose area. I’ll also talk about his consultation with my acne issue right at the bottom after this review. Basically it’s a laser machine which targets the black spots/scars on your skin, the light goes deep down to scatter the pigments & restore that area & rebuild the pigmented skin again. It breaks up the melanin content so that the scars are lightened. The whole procedure lasted about 30 minutes end to end right from waiting at their reception till the time I walked out of their clinic. At first they offer you a cool refreshing drink made of cinnamon, honey & some green tea. It’s their signature drink & was quite delicious I must say! After my doctor visit, they took me to the laser room, tied my hair up and cleansed my face with their cleansing wipes. I tell you, those wipes smelt divine!! If they are non-comedogenic, I am going to get a pack for myself to use on travel. Then the doctors came in, took some pictures of my face, close ups of the scars / spots and then proceeded with the laser. The laser time in total is only about 5 minutes. There are 2 assistants always with you while the doctor is doing the procedure. Once he started the laser, he starts running it through your face on areas where he finds the scars. Simultaneously the assistance sprays fresh cool air through a pipe to cool down your skin & to mitigate the slightly pricking sensation you feel from the laser beam. The sensation you experience while they run the laser is that of a small needle pricking but not uncomfortable as such. On a scale of 1 to 10 with 1 being low & 10 being high discomfort, I’d give it a 4. If you have done peels before, then this sensation is not worse than that if you know what I mean. Once the laser is over, they switch it off, the assistant just wipes your face with a tissue, applies sunscreen & Voila – that’s it, FINITO 🙂 you’re done!! If you are on acne medication like Benzyl Peroxide, salicylic acid, tretinoin, Glycolic acid, then you need to stop using these at least 2 days before & 2 days after using this service. This is very crucial as not following this will have adverse effects. Please note after they do the laser, you will see the small hairs on your face turn white, I mean bleached. They will slough off by themselves after a couple of days. It did bleach for me & after about a week, I saw most of them had fallen off!! For guys this could be important to know. The doctor said improvement in lightening could be seen only after about 10 days & marked improvement would be seen only after about 4 sessions minimum. It is very important to leave your face without washing for at least 4 hours after the laser. You can wash your face in the night but only with cold water & very gentle cleanser like cetaphil. Again very important point. You should not use warm or hot water on your face for at least 12 hours after the laser. Sunscreen use is very important & must be followed religiously to preserve the effects of the laser. Yes, Yes, Yes, It Works!!! I am seeing a 25 to 30% improvement in the scars. It works only for superficial scars I believe but it did lighten the face considerably. It did not lighten the black spots that I have got from recent acne which are just subsiding but the previous marks did lighten. Like I mentioned before, the full effect can be see only when you do at least 4 sessions with them. Would I opt for this service? Maybe yes, but since I am now more focussed on getting the acne under control, I would probably go for this If I absolutely do not have any acne. Now for the doctor’s consultation on my skin: I mentioned to him that I was seeing Dr. Sujaya Hegde or my skin & he examined it & asked me if I would consider OCP’s (oral contraceptive pills). He said they were very effective in protecting the oil glands & preventing the bacteria from settling on the pores. He said OCP’s would shrink the oil glands & decrease their over production. He also suggested that I use Epiduo or Periduo (BP & Adapalene combo) at nights instead of the Retino 0.05% I was using & advised me to use Aziderm cream twice a day for my active acne. This regimen according to him would give faster & better results but he still felt I should either opt for OCP’s or Isotretinoin (God bless his soul! !, I was horrified at this suggestion). I told him I was very wary of the side effects of both especially the latter but he argued that since I wasn’t planning on making any more babies (thankfully – 2 are more than a handful to me), I could be on Isotret with minimal side effects & very safe to use. Anyways I am not planning on doing any such thing at the moment & continuing with my tretinoin treatment & will continue to use it for at least 6 months before I decide to give up!! One thing that I did incorporate was to use Aziderm now instead of BP. So I am using Aziderm alternately with tretinoin nightly. 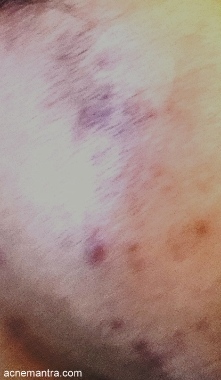 (some issue with resolution as I tried to downsize the pic so the brightness became a little more I guess, pic taken just before the service on clear skin) While seeing the pics, please also remember that I am on a strong strength tretinoin & lightening could also be due to the effect on tretinoin. Nevertheless, some amount of lightening was experience with this procedure & I believe if you go for 4 to 6 sessions each spaced 2 weeks apart, you could see great benefits. After pictures were taken 12 days after the service taken with the same phone and resized to same pixels. Disclaimer: Even though this treatment was sponsored by Kaya Skin Clinic, our volunteer was given free rein to write about their true experience and opinions. We never ask or receive money in exchange for reviews. Opinions about any product on Acne Mantra are driven solely by the effect it has on acne prone skin and nothing else.